Dr. Davis does full spine adjusting as well as extremity adjusting on patients of all ages from newborns to seniors. Both locations have Lloyd Galaxy hi-lo adjusting tables that allow for patients to get on and off of the table with ease. Dr. Davis most often uses the Thompson drop technique when adjusting patients. Thompson technique uses leg length analysis to determine where and how to adjust subluxations. The Thompson technique utilizes a drop table for an adjustment, where a low force thrust is applied to the joint, which in turn, sets the drop piece into motion and adjusts a specific joint in a specific direction. She also uses some analysis from the Sacral Occipital Technique (SOT). 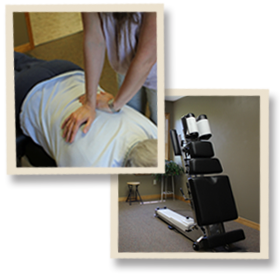 Dr. Davis sometimes uses an activator, a low force adjusting instrument, for spinal, extremity, or pediatric adjustments.